Sometimes I forget just how much I love to discover new beauty brands. The type of brands that provide luxury and innovation and, possibly most importantly of all, quality in a highly saturated industry. That’s why, when I sat down with Jo Loves, I was thrilled to hear about the brand’s incredible story. Founded by Jo Malone in 2011, Jo Loves is her triumphant return back to the fragrance industry she’s so clearly passionate about. During her 5 year break from creating fragrance, after fighting breast cancer and selling the Jo Malone brand to Estee Lauder, Jo realised how much fragrance was a part of her life. Being away from it felt like something huge was missing in her life. So she set up Jo Loves and began creating fragrances that she hoped would bring back powerful memories for her customers. I have to admit though, I had no idea that Jo had even departed from Jo Malone, her namesake brand. With Jo Loves now making its way on to the Net-a-Porter site, shipping worldwide, I think it’s the perfect time to share my thoughts on some of the cult products from the brand. Fragrance is such a personal choice, which is why I’m always really cautious when trying a new scent out. It can be even more difficult to select a new one when fragrances have obscure names that give little clue to what kind of scent is bottled inside. Jo wanted to make selecting fragrances a little easier, by giving each fragrance a name that perfectly represented it. Pomelo, one of their bestselling fragrances, is named simply after the pomelo, a sweet citrus fruit quite similar to a grapefruit. It takes all the unnecessary mystery out of selecting a fragrance – which I think is particularly helpful when you’re buying as a gift! This sharp citrusy scent is designed to remind you of summer holidays with white beaches, fresh linen sheets and sparkling iced water. It’s Jo’s signature scent and one that has a powerful scent that will have people desperate to find out what you’re wearing! Pomelo is available on the Jo Loves website* or in-store, £65 for 50ml or £110 for 100ml. There’s rarely much innovation in the candle world, I mean how can you really innovate something so simple? But that’s where Jo saw a challenge, an opportunity for creativity and developed the Shot Candle Collection. The Shot Candle is made up of a base fragrance and a ‘shot’ fragrance which slots into it. Both parts of the candle can be customised to create your dream scented candle. You can then enjoy each scent as they blend together and fill the room with a beautiful fragrance, hand selected by yourself. There’s lots of unique scents to choose from, such as Mint Mojito, Fig Trees, Salted Caramel and Ouzo & Honey, so it’s really just a case of narrowing down your two favourites to create something special. I’ve been burning my Shot Candle in our new living room to escape the scent of new carpets and fresh paint. So far it’s managed to fill the room with room with a gorgeous new scent and even creep out into the hallway too! My candle is a delicious combination of Saffron Oud and Frangipani, but if you head to the Jo Loves store in London, you can create your very own bespoke candle in their Shot Candle Studio. This would be the perfect present for someone really special, or as a treat for yourself. Definitely a treat for yourself if your not-so-subtle hints don’t quite pay off. 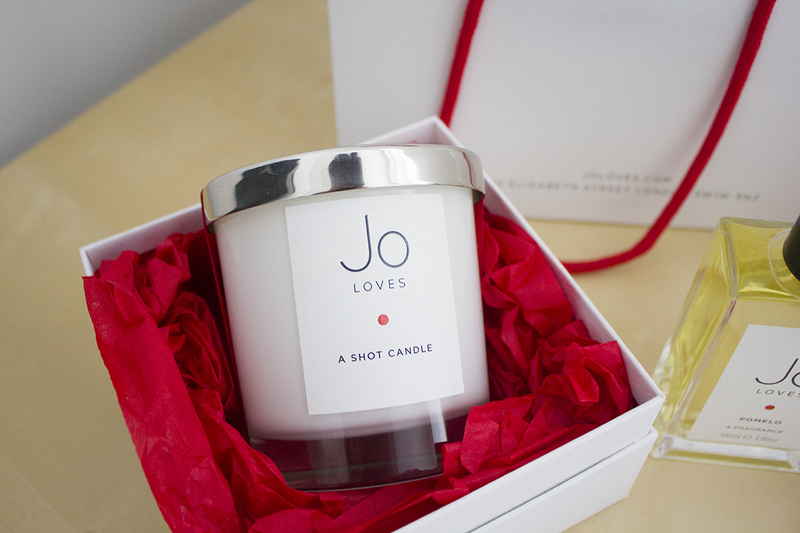 The Shot Candle Collection is available on the Jo Loves website* or in-store, £80 260g. Where can I shop Jo Loves? Jo Loves recently partnered up with luxury fashion & beauty website, Net-a-porter, so you will soon be able to shop the brand with more affordable worldwide shipping for those in Europe and beyond. They are available on Netaporter from 20th June 2016, or you can shop directly at joloves.com. You can also have a one-on-one consultation at their London store at 42 Elizabeth Street, London SW1W 9NZ. What do you think of the Jo Loves brand? Have you tried their fragrances or candles?